Luckily for Yardbird, their food is pretty damn good. This was quite tender and juicy, and you could tell they used top quality chicken. I really enjoyed the wasabi kick in the sauce as well. This dish was under their "Smaller" section but we weren't quite expecting THAT small for the price. While it was pretty tasty - I enjoyed the use of sudachi which gave it a nice citrusy flavour - it wasn't all that surprising. This was one of their specials and while it was pretty interesting with the ponzu sauce (almost tasted like marmalade! ), the pork belly was a little tougher than I would've liked. Again this was a little tough and not one of my favourites. This was probably my second favourite thing we sampled. Chicken oysters are often considered the most tender and flavourful part of the chicken, and these ones didn't disappoint. They were perfectly juicy with just a hint of salt and a squeeze of lemon. The skin that was left on them also made for perfect chicken oil flavour hehe. I already want more! We also ordered chicken wings and a skewer of fillet with yuzu miso, both of which somehow weren't saved on my phone camera. The total bill came up to just under $600 for two (no service charge included) and we both left feeling pretty satiated. 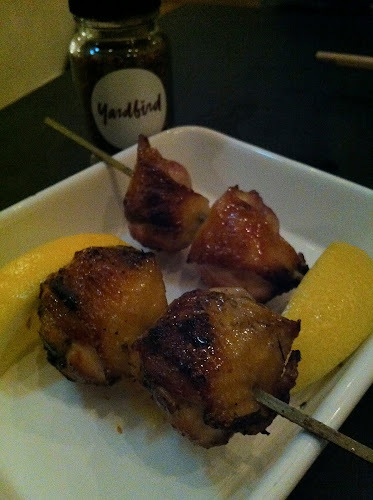 I would suggest giving it a try - for the most part, I was quite impressed by the quality of the skewers we got. However, I won't be rushing back anytime soon. It's pretty pricey as far as grilled meats go (plus $68 for a bottle of water! ), and the food just wasn't as innovative as I was expecting.